I worked to make sure I had decent stripe matching at the seams. When my elbow is straight even the sleeve stripes match too. Pattern Description: Turtleneck style long sleeved knit top in two lengths. I made view B, the longer length top. 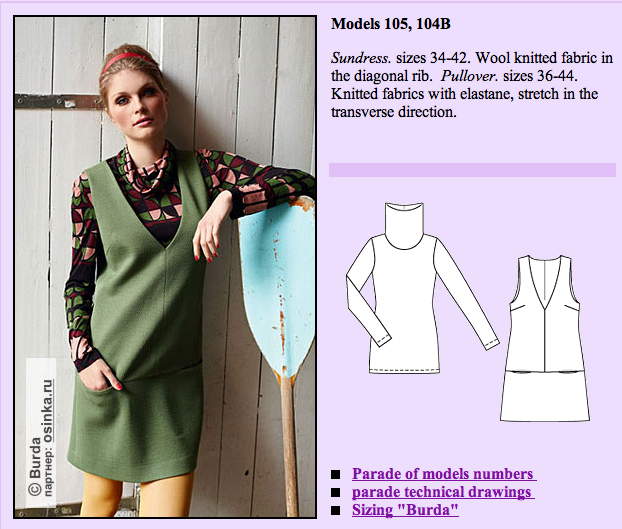 Pattern Sizing: Burda Sizes 34-44. I made a size 40, grading out to a 42 at the hip since this top is so long. Were the instructions easy to follow? Super easy, especially for Burda! This would be a great first pattern for someone new to Burda. I didn’t really need the instructions, but I did read through them, and decided to follow them exactly. Normally I would set the sleeves in flat, then sew the sleeve and side seam all in one, but I wanted to make sure I had more control over matching the stripes, so I decided to follow the instructions and sew the bodice and sleeves separately, then set them in in the round. I think I got better stripe matching this way, though I will say it took a bit longer since I was being more careful with my sewing and sleeve setting. Did it look like the photo/drawing when you were done with it? Yes, I think so. It is a bit difficult to see this top in the model photos, but it does look very much like the line drawing. What do you particularly like/dislike about this pattern? I really like this top! I love the collar – it will be great to wear under coats and jackets when it is cold and windy out because it will provide coverage all the way up to my neck. I also like the extra length – I am forever tugging shirts down, so it is nice to have an extra long top. As usual with Burda, the draft is really good. Love everything about it, no dislikes. Fabric used: A poly-rayon-lycra knit blend from Hancock fabrics. Would you sew it again? Would you recommend it to others? Yes and yes! I really love this top, and I think it would be great to have one in a nice solid black for layering. I don’t know if I am going to sew it again right away, but I do think I will sew this top again in the future. It will be a great top for fall and winter. I think this pattern is great – easy to sew and versatile in a wardrobe so I would highly recommend it to others. Conclusion: Fabulous pattern! Easy to sew, simple instructions, great results, and a top that could be great for layering or for wearing on its own. I think this pattern is a total winner and I plan to sew this again when I find the right fabric. So, yay! New top. Capricious and unplanned sewing is fun. I’ve got one more top to show you all, so stay tuned. Yea! I like yours better than the ones in the mag. I saw them there and thought I'd give this one a miss, but now that I see yours… I think I might have some stripy knits lying around! Great looking top! Excellent job on matching the stripes & the fit is good too. This is lovely! I agree that it looks great in your stripey knit! Looks great – totally love it! Oh! You DID do a great job matching the stripes! Cute top! Your fab looking top inspired me to sew this pattern!